Episode 15 of Inside BU Hockey features Bernie Corbett's interviews with Coach David Quinn, freshman defenseman Charlie McAvoy and Dennis O'Connell, captain of the 1965-66 Terriers. The youngest of the Terriers also is the youngest player in Division 1 this season, McAvoy has 13 points (2G, 11A) this season including his game-winning goal (video) in Monday's Beanpot opener. The Long Beach, N.Y., native was the top-scoring defenseman for the NTDP U18s last season with 40 points and, along with fellow freshman Jordan Greenway, won a gold medal in the IIHF World U18 Championships. 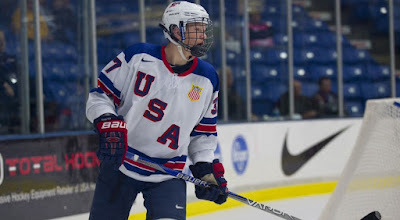 Last month, McAvoy and sophomore Brandon Fortunato skated for the U.S. bronze medal winning team at the World Junior Championships. A native of South Boston and a member of Jack Kelley's first recruiting class, O'Connell scored 94 points in three varsity seasons. 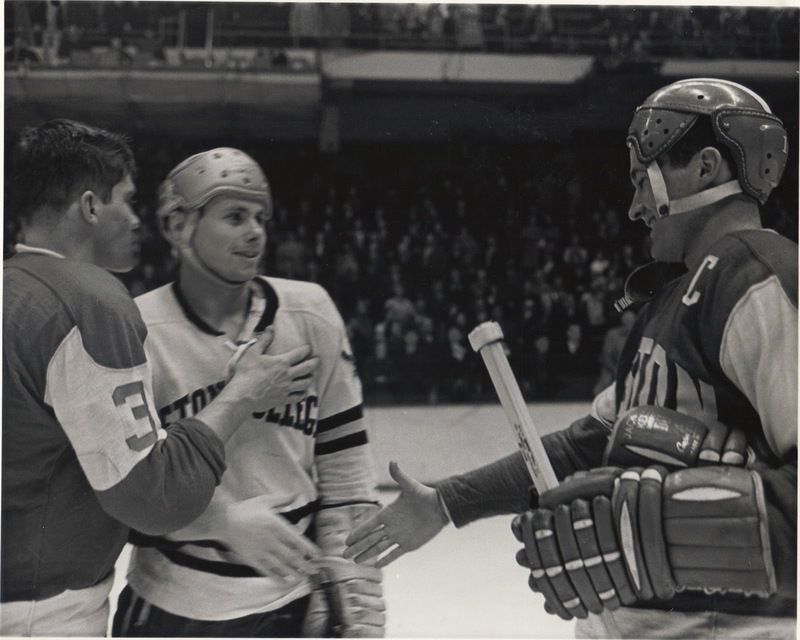 Fifty years ago, he helped lead BU to the first Beanpot championship and first NCAA tournament of the Kelley era and a 27-8-0 record. It was following the 9-2 win over Harvard in the Beanpot final that a winning team first skated the Beanpot Trophy around the Boston Garden ice. BU Hockey historian Sean Pickett has updated his data bases of BU Beanpot records and Terrier records for games at TD Garden . Among the former Terriers who attended Monday’s Beanpot semi-final were Matt O’Connor, former All-American, co-captain of the 1978 national championship team and 1980 Olympic gold medalist Jack O’Callahan (photo), and high-scoring defenseman Gary Fay who flew in from Switzerland. 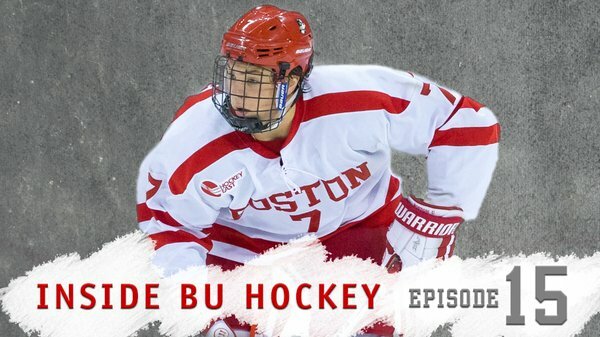 Jack Eichel guested on NHL Live (audio) to talk about his rookie season as well as the Beanpot Tournament. Eichel recorded his 35th point of the season, assisting on a goal in Buffalo’s 4-2 win over Montreal. Eric Gryba (photo) scored his first goal of the season in the Oilers’ 5-1 win against Columbus. Adam Clendening, in his first start since being acquired by Edmonton, contributed an assist, a block and three shots on goal. Colin Wilson returned to Predators’ practice for the first time since suffering a lower-body injury in January. Chris Bourque, who scored the game-winning goal in the 2005 Beanpot championship game (video), fired two goals to lead Team Atlantic to the finals of the AHL All-Star Classic. The duo of Clayton Keller and Kieffer Bellows has been unstoppable, and that’s good news for both NTDP and Boston University. The two Terrier commits are both well over a point-per-game pace with Keller averaging 2.00 Pt/G and Bellows at 1.59 Pt/G. Bellows capped off his weekend with four goals, and two game-winning goals in a back-to-back set. Just as impressive has been the play of 2017 NHL Draft eligible goaltender Jake Oettinger. The Lakeville, MN native is chasing every Team USA USHL goaltending single season record including John Gibson’s 2010-11 USHL season record for save percentage (.926%), Thatcher Demko and Jack Campell’s GAA record (2.21) and Demko’s 2012-13 record for most wins (15). With seven games remaining Oettinger is 10-1-0-0 with a 2.16 GAA and .925 SV%. USA Hockey spoke with 2017 recruit Brady Tkachuk about how father, former Terrier, NHL standout and US Olympian Keith Tkachuk, and brother Matthew Tkachuk helped the NTDP U17 power forward develop his game. 2018 recruit and Tkachuk’s teammate on the U17s Logan Cockerill is featured in the current edition of MIHockeyNow Magazine. 2018 recruit Tyler Weiss scored twice in the Don Mills Flyers 5-2 win over the Junior Canadians in game four of their GTHL playoff series. The speedy forward from Raleigh, N.C., scored the Flyers’ first goal on a power play and provided the game-winner on a penalty shot. Weiss, who has been named to Team USA for this month’s Youth Olympics in Norway, has scored 21 goals and 18 assists in 29 games. 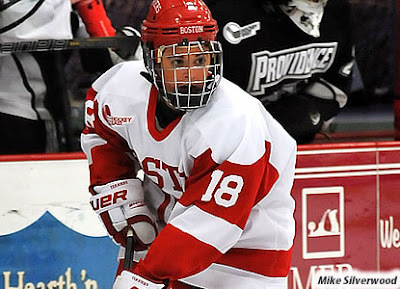 Terriers dropped a 3-2 decision to Northeastern in the Women’s Beanpot opener on Tuesday at Walter Brown Arena. Rebecca Russo gave BU a 1-0 lead midway through the first period, assisted by Rebecca Leslie and Alexis Crossley. However the Huskies scored twice in the second and once in the third period for a 3-1 lead. Crossley scored an extra-attacker goal, assisted by Leslie, with two minutes left in the period, but that was as close as the Terriers could get. Erin O’Neil stopped 27 Northeastern shots. BU will play Harvard in next Tuesday’s consolation game.